You will have heard of the recent tragic accident that took the life former Liverpool and Rangers footballer, Avi Cohen. Well, a storm has erupted over the the use of his organs. Y’see, Avi carried a donor card. Avi’s family were in support of his organs being used to help save the lives of others. However, religious ministers put the kybosh on it all. The reason? Well, medical science has advanced, as it is bound to, where religious dictat has stayed in the dark ages. We are now able to keep bodies alive by the use of life support machines to give the patient the greatest chance of survival whilst there is still the minutest possibility of hope. It is the advancement of medical science that has enabled us to do this – however, as a result of this, we can prolong the “life” of patients by maintaining blood flow through the vital organs – even though scientific knowledge tells us when the body is clinically dead and cannot be reversed – in short, switch off the machine and the patient dies. But our religious leaders seem happy to accept the fact that science can intervene to keep bodies “alive” but do not accept it when science informs us that the body is clinically dead – when scientific evidence declares a body clinically dead – they are, for all intents and purposes, dead. However, the act of switching off the machine, thereby stopping the blood flow, has been likened by religious leaders as akin to murder. These are ignorant people who mislead their followers into believing they can bring brain-dead people back to life – they do not have the capacity, in my view, to make that judgement – and even if they did, science will prove them wrong. I say, let the religious leaders do what they do best and let medical science do what it does best. If you don’t like the consequences of medical advancement then don’t accept its benefits – stay in the dark ages and let those who have real faith – faith in medical science – have the opportunity to either extend their own lives or provide the rest of us with hope. Just as an addendum – the shortage of available organs within religious communities has led to an increase in the black market trade of such organs – now where exactly in religious doctrine is that practice acceptable? Postscript: On re-reading this post prior to publication of this diary I have felt it necessary to re-evaluate my view on this topic. It was following a discussion with my good friend Abraham, an orthodox Jew, who put it this way (*). Scientific fact is only fact as we know it today. Tomorrow, however, science may discover new ways of keeping people alive when initially pronounced clinically dead. So, continue with medical scientific advancement to improve the welfare for all, but don’t assume that you have the facts at any given point in time. With this in mind, I find myself sympathetic to that viewpoint. (*) Abraham, I hope I have represented your view accurately, and thank you for your honesty and insight. 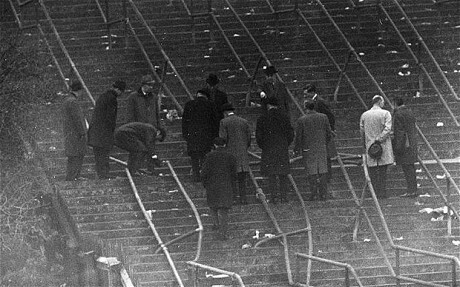 Today is the 40th anniversary of the Ibrox Disaster. This is an event indelibly stamped on my childhood memory. I remember it for a number of reasons – not all fully mature, but I was only 11 at the time. You have to trust me that for a child growing up in Glasgow, even as a Jewish boy, the intense rivalry of Rangers and Celtic, both footballing and sectarian was gigantuan. Efforts in recent years to dilute the passion have been partially successful, but it is still an intense affair. In 1971, it was collossal. And so it was that the traditional New Year’s Old Firm fixture was upon us – 80-odd thousand fans packed into standing terraces cheared on their team. On this occasion, by all accounts, it was a nothing match – in that nothing much happened football-wise – until the 89th minute when Celtic’s winger-magician Jimmy Johnstone scored for Celtic. Cue mass celebration on the green and white side of the stadium. Cue mass exodus by the home support of red, white and blue. Incredibly, with only seconds remaining, Rangers’ poacher centre-forward, Colin Stein, went up the other end and scrambled the ball home for an unlikely equaliser. Initial reports “blamed” Stein for this event that resulted in the exiting Rangers fans trying to return to their places on the terraces to cheer on their boys, only to find their places had been taken up by more exiting fans who had stopped, been pushed back, tripped and trampled on – and back down the terraces like dominoes. 66 people were suffocated to death and a further 200 injured. Months later, investigators found no reason to link the action on the field to the events on the over-congested stairway. However, families were shattered and innoncent on-lookers like myself were left with the images of dozens of body-bags being lined up on the pitch. I was kept away from much of the news images, but I do remember this – we had a Scottish version of Match of the Day, called Sportscene. A half-hour program showing highlights of a top Scottish game and a few minutes of a top English game. I remember, to my shame of innocence, that they did not show the goals from the Rangers v Celtic of earlier in the day, but instead showed only the English game – which, bizarrely, was Blackpool, who have only just this season returned to the top flight of English football. As I watched the 40th anniversary program today on TV prior to the Old Firm match, they showed… and I saw, for the first time ever, the two fateful goals from that game – and that sent a shivver down my spine I can tell you. Sadly, nothing was ever done after Ibrox to prevent future disasters of that type – not after Heysl either, not after Bradford, but only after Hillsbrough – so hundreds of others have persihed at football games whilst we awaited the authorities to make the necessary changes to the way we watched matches – all-seater stadia have been the single most important “innovation” that have made the football fans’ experience a whole lot safer.